Minnie May got into a box of holiday things in my apartment while I was at work- I was reorganizing some closets and had not yet finished. She decided the manger scene looked appetizing. 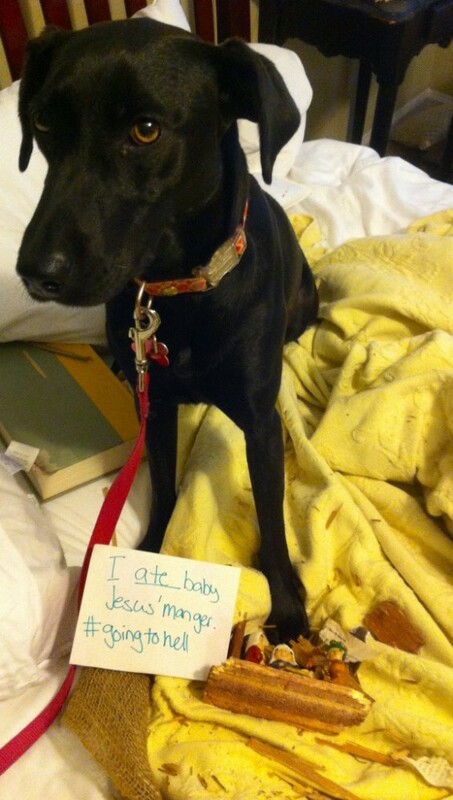 Her shame sign reads “I ate Baby Jesus’ manger! #goingtohell.” She is a mess. Posted December 8th, 2015 . My parents’ dog ate a lamb from their 40+ year old nativity set (they got in the first Christmas they were married, 1972). The set had been through 4 other dogs, 2 cats, and of course me without incident. My cousin bought them a new set of sheep for it for Christmas. I have a wooden Noah’s ark set with just one cat. Our dog at the time, Duke, completely destroyed one of the cats in the pair (as in I NEVER found any remains of it). That was many years ago and Duke is no longer with us but I always remember him with the fondest of memories when I see the ONE cat prominently displayed on the ark. And it’s a great conversation starter when people ask why there is only one cat instead of a pair. All dogs do go to heaven…even the ones who eat wooden cats and Baby Jesus’ manger! 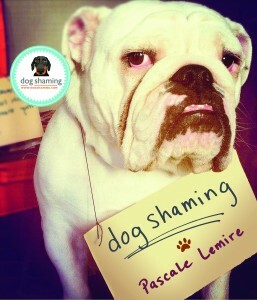 Please don’t say that…All dogs are angels and they all go to heaven. After all “manger” is French for “eat”! Years ago, Leia, our Golden, ate our baby Jesus in the manger. My son, who was 8 years old at the time, told me not to worry and that Santa would bring a new one. (Talk about mixed religious metaphors!) I can’t tell you how many stores I went to until I found a replacement.